There are only six levels in the new Hitman game, but each is a world unto itself: elaborately mapped, highly detailed, roamed by as many as a couple hundred non-player characters, the guards and gardeners blissfully going about their daily business, walking their own routes, tending to their own narrowly defined jobs and objectives. 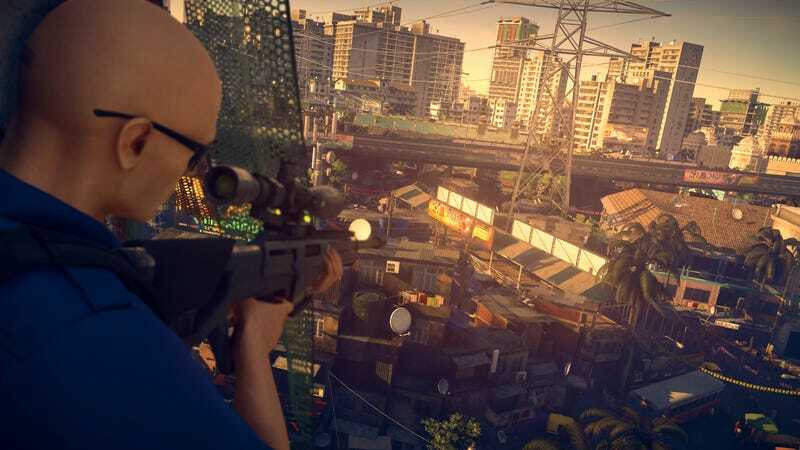 The previous entry in the series, a fiendishly fun reboot called simply Hitman, established this new standard of environmental immersion, sending everyone’s favorite globe-hopping assassin to various densely populated international locations, from a tropical hotel in Bangkok to a fully realized Italian seaside town. 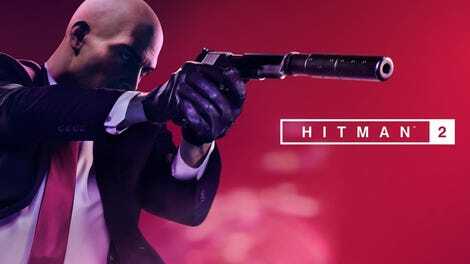 With Hitman 2, the team at IO Interactive has doubled down on that approach, offering backdrops even more complexly conceived than those in the last game. The second episode, for example, takes place at a racetrack in Miami, and great care has been taken to assure that every square inch of the arena is abuzz with activity, that every parking lot, mechanic pit, and bleacher section feels like a place you could really visit. One is tempted to describe Hitman 2 as an open-world gaming experience. Isn’t its facsimile of the slums of Mumbai, the fourth destination, as lovingly, meticulously designed as the one-horse towns of Red Dead Redemption 2? Yet open-world games are about freedom and discovery: They offer vast sandboxes for the player to explore, creating the illusion of a map without borders and an adventure without end. In appeal, Hitman and its new sequel are almost anti-open world. For as intricate and bustling as the levels tend to be, these games hinge more on making a big world feel smaller and more manageable—not through an endless supply of things to do, but thorough the repetition of only a couple of tasks, performed an endless number of ways. In Hitman, finding that perfect view to a kill (or setting off a domino effect of death) is really a fantasy of control: What if you could not just see, but also memorize and take advantage of, all of life’s secret patterns? As the latest installment in a very popular series, Hitman 2 naturally tweaks its formula with bells and whistles. There are new weapons and gadgets and tools, including a picture-in-picture system that alerts you to the approach of suspicious parties or the offscreen fruit of your murderous labor. You can now blend into crowds and hide in tall grass. And, most notably, there are multiplayer activities, including a compulsively playable sniper mini-game with cooperative play and a work-in-progress competitive “ghost mode” that pits online players against each other in a race to fulfill the same contracts. But the core game is the same. You once again assume control of the genetically modified Agent 47, who remains—despite the chrome dome and conspicuous barcode seared into the back of it—hilariously adept at assuming any identity. There is, as always, a strong James Bond influence, from the swelling cool of the spy-movie soundtrack to the iconic sight of a tuxedoed agent sneaking around swanky European soirées (including, this time, a secret-society masquerade in a castle). In dress and suavity, 47 is basically a less noble 007, killing for cash instead of country. But in practice (and play), he’s more like Phil Connors from Groundhog Day, except that instead of catching kids falling from trees, he uses his four-dimensional grasp of his surroundings to pull off ambitious slayings. Like poor Phil, forced to relive the same day on infinite loop until he’s an expert on it, the player comes upon this godlike perspective through repetition. The levels, explicitly intended to be played and replayed (and all available upon purchase this time—the staggered release strategy has been canned), can seem dauntingly labyrinthian the first couple times through them. But slowly, you start committing their layouts and clockwork mechanics and vulnerabilities to memory, learning your targets’ schedules and mapping their walking paths. Even the tightest security protocols have weaknesses that can be exploited—including human ones, the character quirks and personal grudges that offer windows of access to your marks. Lest anyone feel even the tiniest prick of guilt about playing as a cold-blooded killer, Hitman 2 bends over backwards to assure players that the fictional bigwigs they’re poisoning, garroting, drowning in toilets, etc. aren’t just ruthless terrorists. They’re also rich dicks who treat their employees like garbage and stroke their own egos constantly. In other words, as your British handler tells you at one point, “They have it coming.” This is key to the game’s gallows humor; like the Final Destination movies, which hinge, too, on “accidental” cause-and-effect fatalities that would make Rube Goldberg proud, these stealth games are also stealth black comedies. Certainly, it’s easier to key into the franchise’s crooked sense of mirth than to invest much in its uber-serious overarching narrative, involving double-crossings, a massive global conspiracy, and the tortured, endlessly re-explored childhood of 47, who makes Jason Bourne look like a high-energy extrovert. Are there more skippable cut scenes than the ones in Hitman’s “world of assassination”? Here and there, the series stumbles into witty satire. One of Hitman 2’s best episodes takes place in a cozy, white-picket Vermont neighborhood, and the identical blueprint of every home plays like a joke at the simultaneous expense of suburban architecture and video-game level design. Mostly, though, the game tends to be at its funniest when it tasks you with turning the targets’ vanity and narcissism, their character flaws, against them. Usually, this is through the guided “mission stories,” which entail eavesdropping on NPC conversations, often donning a disguise, and following a pre-charted course of “opportunities” to some explosive conclusion. In the aforementioned Miami mission, “The Finish Line,” they have some amusingly outrageous payoffs, like shoving a star race-car driver to her demise while dressed as a Gritty-like mascot or programming her weapon-manufacturer father’s A.I. soldier to gun him down during a demonstration, RoboCop–style. Yet these multi-part assassination plans can also feel unexcitedly like an ongoing tutorial, taking all the problem-solving and strategizing out of the equation, just walking you through a series of steps. Thankfully, the extra help can be toggled off. It’s more entertaining, frankly, to pull off your own custom kills. Or to botch them. Hitman 2, like most of its predecessors, is catnip for perfectionists: It rewards patience, careful preparation, and attention to detail—an obsessive-compulsive alternative to trigger-happy action gaming. But as satisfying as it can be to successfully weaponize your understanding of the game’s teeming environments, to convert chaos into control, there’s a lot of fun in watching your best laid plans go astray, too—to having your disguise fail to fool someone, to getting caught dragging a body to a hiding place, to failing to clear out of a restricted area fast enough and suddenly having five bodyguards raining hellfire onto you. These hot-water predicaments, the product of bad luck or even just slightly bad timing, can turn Hitman 2’s learnable network of patterns into a mad scramble, forcing even the most meticulous planners to wildly, hysterically improvise. In those moments, when it all goes FUBAR, you really do feel like you’re in a real world (open or no), where major fuckups are much more common than perfectly executed executions.